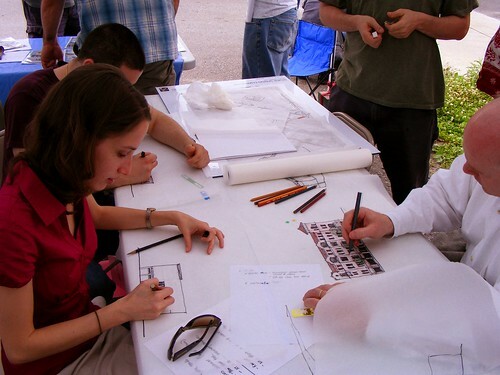 Last Saturday, designers, architects and planners held a charrette, or design workshop, at Fenton Street Market in downtown Silver Spring. 1) What kind of development should we have in Silver Spring? 2) How much development should we have? 3) How should we get around? 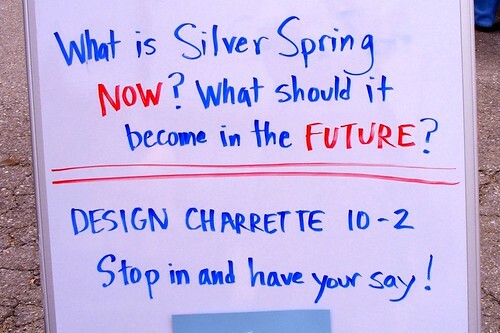 Dozens (if not hundreds) of residents stopped by to give input on how they'd like Silver Spring to grow. Most seemed happy with the community they live in today, but there was a lot of disagreement over its future. Over the next few days, we'll look at some of the issues that charrette participants raised. Style is how most people who aren't architecturally trained understand the built environment. It's easy to "get" buildings if you can classify them as Victorian, Modernist or Art Deco. 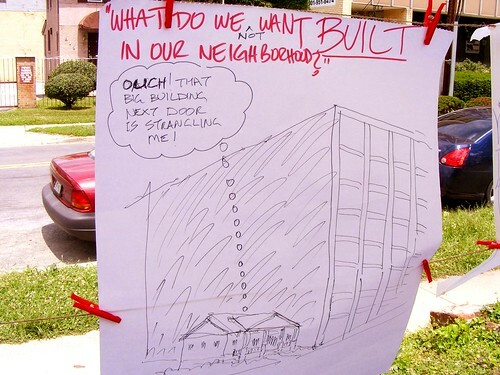 But style doesn't describe how a building works with or against its occupants, site and neighbors. An "ugly, modern box." Drawing by Steve Knight. Many people complained about the increase in "ugly, modern boxes" in Silver Spring. "I'm sick of all this glass and chrome," complains one woman. (We eventually figure out that by "chrome" she means "steel," as downtown Silver Spring is not a 1957 Chevy Bel-Air.) She feels that newer buildings downtown were cold and sterile and preferred older buildings. They're the soul of Silver Spring, she says. She also doesn't like the new development on Ellsworth Drive. It has little glass or steel, but it was designed to feel like an outdoor shopping mall, not a city street. It feels "fake" to her, the woman laments. "Of course it looks fake," I say, picking up a marker. "It's new." I start drawing and explain. Parts of Ellsworth pay homage to the old stuff - the Majestic 20 theatre, for instance, mimics the curved façade of the historic Hecht Company building (now City Place Mall) across the street. Left: My drawing comparing the Majestic 20 (left) to City Place Mall. Right: the Majestic 20 in real life. "And even though the buildings may seem inauthentic, the people are always real," I continue. "Kids my age, who grew up with Ellsworth Drive, love this place. I'll bet you that in twenty years, it will be an integral part of Silver Spring's culture." Nonetheless, she asks me to draw her some traditional buildings for Silver Spring. 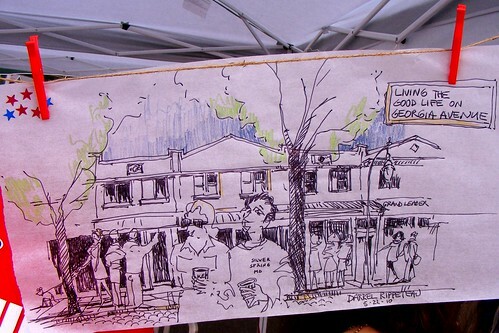 I draw her a picture of some old storefronts on Georgia Avenue. They look much as they did in the 1920's, but have since experienced ninety years of history: different shops, different people, different times. "I love it!" she says, throwing up her hands in delight. "What you're looking for is character," suggests Darrel Rippeteau of Rippeteau Architects. "In the future, say you want more character, not less modern." Steve, Tony and Sandy's "Vision for Fenton Village." 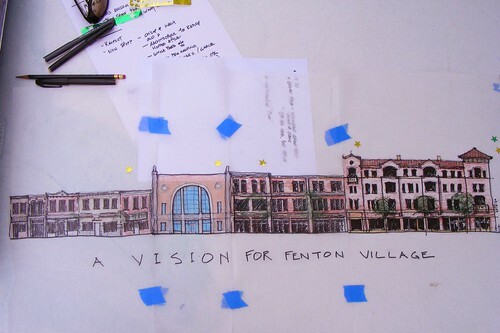 A few tables away, architect Steve Knight of David M. Schwarz Architects and my friends Tony Maiolatesi and Sandy Schwartz - like me, both recent grads of the University of Maryland - are drawing a "Vision for Fenton Village" with traditional buildings. It didn't look too different from Bethesda Row or Kentlands, developments purposely designed to feel old. These places have good urban design, with buildings close to the street and smaller, human-scaled features. There's also been no shortage of complaints that their style - lots of bricks, double-hung windows, and arches - feels "kitschy" or nostalgic. 1920's-era storefronts on Georgia Avenue, drawn by Darrel Rippeteau. Of course, many people like and often prefer this aesthetic. But these two things are mutually exclusive. You can have an attractive building with poor urban design, like this strip mall in Frederick. 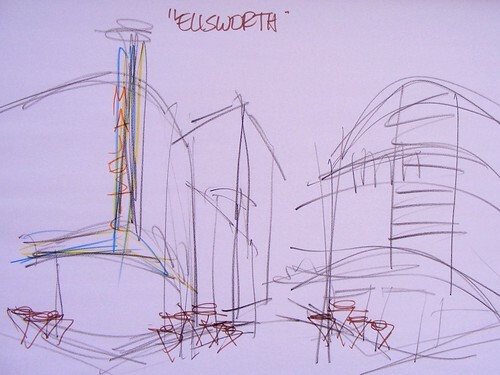 But you can also have buildings with great urban design but poor aesthetics, like those along Ellsworth. Yet none of these buildings can really have "character," no matter how old they look, if they're new. Character takes time to create, but it doesn't discriminate by architectural style. It is helped, however, by good urban form that encourages people to spend time in a place. If we want a Silver Spring with character, we should worry less about the aesthetics of a building and more about how they relate to the user and to their context. Come back tomorrow for part TWO of our charrette re-cap, but in the meantime, check out this slideshow of the Fenton Street Market charrette. As a participant of the workshop, I think you captured the sentiments of most people accuratley. I would however disagree with a few of your characterizations. Character does indeed accrue over time, but some materials age more gracefully than others. While an eclectic by nature I still feel that the glass and steel buildings (prefered by most architects) don't age as gracefully as buildings of brick or stone (preferred by most lay people). It's apparent that the "lay" architectural students are "taught" to appreciate the modernist styles in school, which seems odd if they are to work for their "lay" communities. Even with out time, the lady you spoke with seemed to react viscerally to the "traditional" street scape, time not withstanding. Modernist buildings where originally conceived in a distinctly anti-urban context, that isn't to say they can't fit nicely in a good pedestrian street, but one of the reason may people have negative feelings towards them is the context from which they where concieved. That being said, our new Civic Building is beautiful and extreamly urban, I just wish more architects would unburden themselves of the puritanical modernist heritage that says any historical ornament is nostalgic and therefore intellectally soft. We are decorating animals, from the earliest cave drawings, to the steel I beams Mies Van De Rohe hung from his Seagrams building. We need to remember that we are responsible to the public, not academia. I think Melanie has made some excellent points. Most people just want to feel comfortable and safe where they work and live and may find it more difficult to feel that way in a "glass and chrome" environment. Using materials that give an older vibe really does help to create a more cozy feel even if it does look somewhat contrived at first. I mostly like what they've done with downtown Silver Spring so far. It may look a little bit "fake" or whatever, but it is a heck of a lot more pleasant and is a lot more useful to more people than what had been there before. There is always a bit of a dilemma with creative types - artists, musicians, hairstylists, and probably architects and urban planners too, about trying to achieve an appropriate balance between their own personal artistic vision and what their audiences will actually like in the long run - and I know that is sometime very difficult to predict, but I think that is probably the most important thing to consider when designing what will hopefully become permanent structures. It definitely seems like these days fewer people are receptive to creative new modern styles than in the 1940s through the 1970s. So perhaps the architects and designers should focus more of their creative energy into things like footprints and floorplans and energy efficiency in order to make things function comfortably and flow well for all of the people who will hopefully enjoy using the space for years to come. Reaching out to the people with this workshop is a wonderful idea - it's great to see that architects and designers are interested in the opinions and tastes of the lay people and are willing to incorporate what they learn from them into future designs. 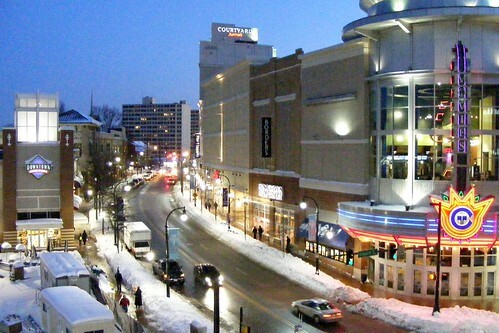 Silver Spring will be a happier place if people actually like what they see around them.